Everybody loves cockapoos. They’re known for being one of the most adorable, fun and kind breeds around—and for good reason. But that discipline and joy doesn’t happen overnight. Proper training is needed to ensure that your cockapoo grows up to be a dog that everybody will love. And like any dog training, that needs to start at an early age. It’s safe to say that over the course of a cockapoo’s life, you’ll be using the leash with them a fair amount. But dogs shouldn’t see the walking device as something that’s harmful to them, and neither should you. To establish a comfortable relationship with the leash early on, let your puppy walk around the house with the leash on regularly. That way, they’ll get used to the feeling of a leash, without the stress of being attached to it. This goes without saying: be kind and gentle with your dog from an early age on. The more you touch and handle your dog, the better they’ll be with other people, and handlers. They need to learn that humans aren’t threatening, and the best person to start with is you. Like all puppies, cockapoos love to play, and socializing is a key part of their development. But sometimes, that play can involve a small bite, or two. If not taught otherwise, the cockapoo will grow up thinking that biting is normal, and will not hold back. One of the most important things an owner can teach a puppy is bite inhibition—you have to show the dog that biting is not okay. A short time-out, or verbal no-nos, are both great ways to discipline without harm. If you keep these tips in mind, your cockapoo puppy will be on its way to becoming a great dog. 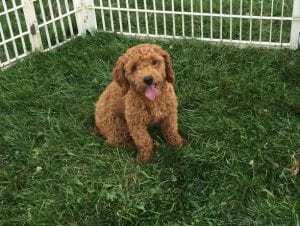 For any other questions or concerns regarding cockapoo puppies, don’t hesitate to contact us at Family Puppies. We’re always happy to help!